Posted by Pamela Eve on September 1, 2016. Back in June our Directors went on an adventure – to raise money for the The Children’s Magical Taxi Tour, who take ill children to Disneyland every year since 1994. Our Directors drove a TX1 cab on a #Clock2Rock Rally from Big Ben to The Gibraltar Rock to fundraise for the trip, and from their efforts we’re proud to have raised money to sponsor three cabs! Read more about the fundraising trip here. For the 23rd time the charity will once again set off in a convoy of London Black Taxis, City of London Police escorts, London Ambulance NHS Trust vehicles, Gendarmerie Nationale and AA breakdown trucks – that will be over 3 miles long when driving! They are on a Magical Taxi Mission – to make their way from Canary Wharf to Disneyland Paris for a once in a lifetime long weekend full of Disney magic for children with life debilitating illnesses. Last year the Evening Standard picked up the event and featured the convoy in an article with quotes from the charity members. It’s great to see the cause getting positive press attention. 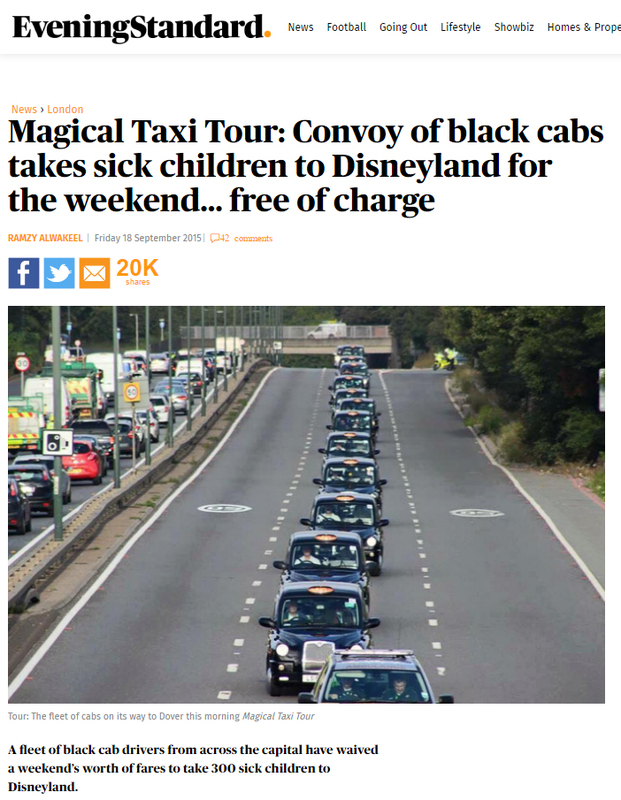 Driven by black cab drivers who give up their time to help with the charity, and funded with money raised throughout the year to go towards the trip, the hundreds of children who attend get to have a journey to remember. Before they leave they’re treated to a BIG Breakfast, where a band plays and breakfast is served and the celebrations for the trip begin. They then have a fun filled weekend in Disneyland where a Gala Dinner finishes off their trip and they get to dance the night away with their favourite Disney characters. We wish everyone attending this year’s Magical Taxi Tour 2016 a fantastic time!